"How to Successfully Implement an ERP System"
How to prepare for an ERP and how to successfully implement an ERP system? Enterprise resource planning (ERP) system has been one of the most popular business management solutions, providing benefits of real-time capabilities and seamless communication for business in large organizations. However, not all ERP implementations have been successful. One of the top reasons ERP implementations fail is because the software doesn’t meet basic industry specific business requirements. However, purchasing an ERP application is only half the battle. A well designed ERP implementation plan is the key to success. How to choose an ERP system that aligns with your company’s specific business requirements? 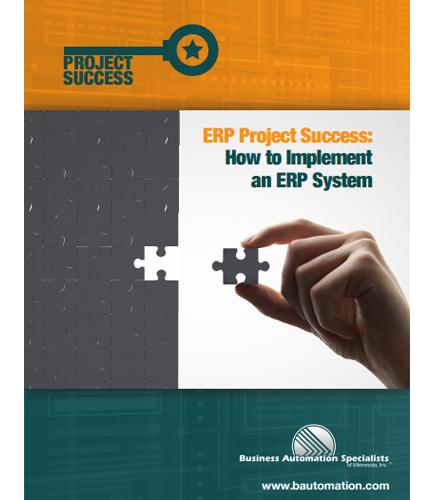 A step by step guide to implementing ERP software, beginning with project organization, and taking you all the way through discovery, implementation, testing, configuration and training. As an added bonus, you will also get to know about some common risks that arise during the ERP implementation process and recommendations for managing them. Implementing an ERP system is not straightforward, but remembering some of these simple suggestions will help your project have a greater chance of success than ignoring them.